Vote To Be Held On Don't Ask Don't Tell Says Reid : The Two-Way Senate Majority Leader Harry Reid says he will hold a vote on the repeal of the ban on openly gay service members after the Thanksgiving recess. In what may be the final opportunity for opponents of the ban on openly gay people serving in the military, Senate Majority Leader Harry Reid says he will hold a vote on the repeal of Don't Ask, Don't Tell after Thanksgiving. The measure passed the House earlier, but Republican opposition in the Senate stalled the measure. President Obama is pressuring the Senate to move on the measure. The vote will come only a few days after the official release of a Pentagon study of soldiers' attitudes towards serving with gay people. 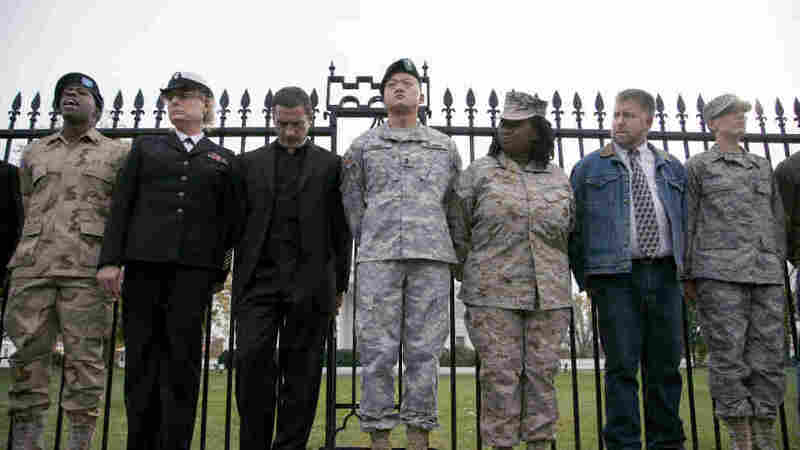 A draft of the report reportedly shows that most soldiers would be fine with serving with gay people. Secretary of Defense Robert Gates has said he wants DADT to end. Chairman of the Joint Chiefs of Staff Mike Mullen says it is a matter of integrity, and that forcing men and women to lie about their sexual orientation in order to serve in the military hurts both them and the military. The opponents of lifting the ban are led by the senior Republican on the Armed Services Committee Senator John McCain. Interestingly, his wife, Cindy McCain, recently appeared in an anti-bullying video in which she called for an end to DADT, saying, one of the reasons for teen suicide is: "Our political and religious leaders tell LGBT youth that they have no future. They can't serve our country openly." But then, in an act of seeming cognitive dissonance, twittered a bit later , "I fully support the NOH8 campaign and all it stands for and am proud to be a part of it. But I stand by my husband's stance on DADT."